← 363 "The Last of the Red Hat Mamas"
The Italian Bob is the eighth episode of season 17. The episode aired on December 11, 2005, and was written by John Frink and directed by Mark Kirkland. Maria Grazia Cucinotta guest starred and Kelsey Grammer reprised his role as Sideshow Bob. "Mr. Burns's Stutz Bearcat finally breaks down, so he decides to buy a new Italian sports car, and asks Homer to pick it up for him. The Simpsons go to Italy but end up in a small town where the residents aren't aware of the criminal past of their new mayor - Sideshow Bob, who is now married and has a son. Marge quickly finds out what "vendetta" means in English." When Mr. Burns' 1910s-model car is beyond repair, he purchases a LamborBugatti Ferrari Fasterossa car and assigns Homer Simpson to travel to Italy, where the car will be acquired. The rest of the family comes along with him, and after they pick up the car, they have a great time touring the country. However, after a huge wheel of Mortadella lands on their car, they push it into a small Tuscan village nearby called Salsiccia. When they get there, they ask an elderly woman for help, and she tells them that the mayor speaks English. 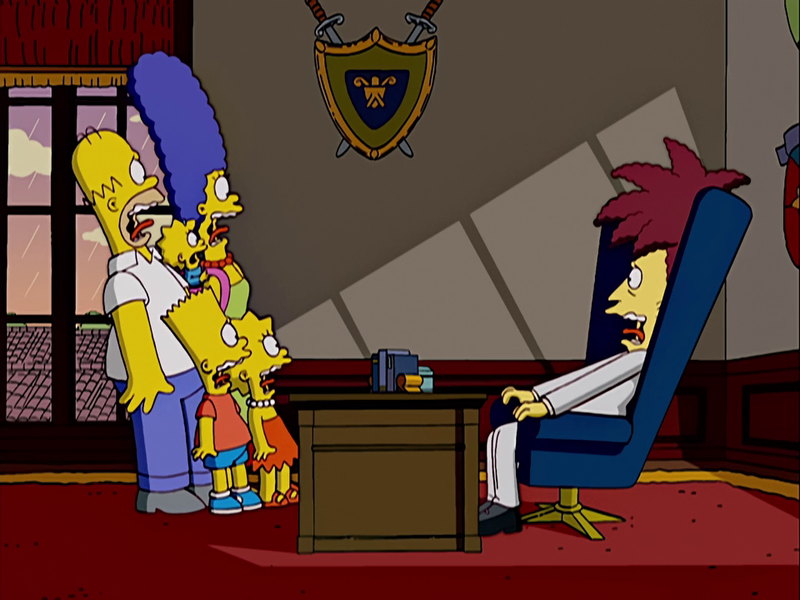 However, they find out the mayor is none other than Sideshow Bob. He explains to them that after he attempted to kill Bart, he came to Italy to begin a new life. After a rough start, the natives warmed up to him after he helped them crush grapes into wine (using his enormous feet). After that, they elected him mayor of their village. Bob no longer has any intention of killing Bart, and it is revealed that he has a wife and son, Francesca and Gino, and they don't know anything about his past life in the United States. Now that he is a citizen of Italy with no criminal record, Bob begs the Simpsons not to tell anyone, and they agree in order to have the car fixed. The Simpsons enjoy spending time in the village, and they continue to keep Bob's past a secret. However, after Lisa drinks some wine at a party, she starts to spout off about him being an attempted-murderer. He leads her away from the table, but as she stumbles backwards, she rips off his suit and everyone can see that underneath is his outfit from Springfield Prison (which Bob somehow never bothered to dispose after his release from prison). The villagers of Salsiccia find out that Bob was a citizen of the United States with a criminal record, and strip Bob of his mayorlty. The Simpsons take off in the fixed car, and Bob swears vendetta on them. Sideshow Bob performing the climax of the opera. Meanwhile, the Simpsons are wondering what they should do next. Lisa spots a bus with a poster advertising Krusty the Clown's performance in Pagliacci. They meet up with him at the Colosseum, and he puts them in as extras. 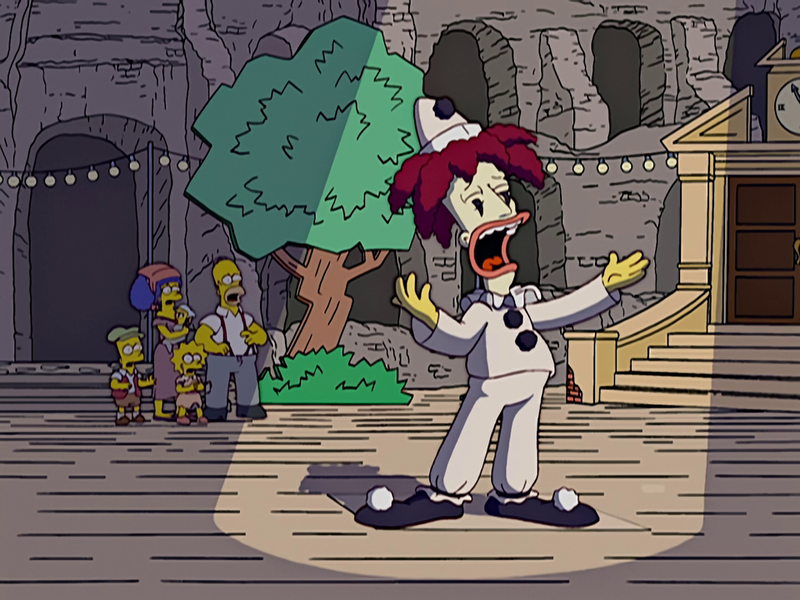 However, Bob, Francesca and Gino find them and corner them on the stage while Krusty who is getting booed by the audience, went into a trap door and flees the stage, allowing Bob to perform the climax of Vesti la Giubba, (which his performance gains a standing ovation). Before they can kill them, though, Krusty's limo picks them up. The Terwilligers walk away with evil smiles, no doubt plotting revenge. Kelsey Grammer won the Emmy Award for Outstanding Voice-Over Performance for his voice portrayal of Sideshow Bob in this episode. Modified on March 22, 2018, at 11:06.